In its simplest terms, design analysis is a powerful software technology for simulating physical behavior on the computer. Will it break? Will it deform? Will it get too hot? These are the types of questions for which design analysis provides accurate answers. Instead of building a prototype and developing elaborate testing regimens to analyze the physical behavior of a product, engineers can elicit this information quickly and accurately on the computer. Because design analysis can minimize or even eliminate the need for physical prototyping and testing, the technology has gone mainstream in the manufacturing world over the past decade as a valuable product development tool and has become omnipresent in almost all fields of engineering. Design Analysis employs the finite element analysis (FEA) method to simulate physical behavior of a product design. The FEA process consists of subdividing all systems into individual components or “elements” whose behavior is easily understood and then reconstructing the original system from these components. This is a natural way of performing analysis in engineering and even in other analytical fields, such as economics. For example, a control arm on a car suspension is one continuous shape. An analysis application will test the control arm by dividing the geometry into ‘elements,’ analyzing them, then simulating what happens between the elements. The application displays the results as colour-coded 3D images, red usually denoting an area of failure, and blue denoting areas that maintain their integrity under the load applied. Engineers analyze just about every type of product development and research effort imaginable. 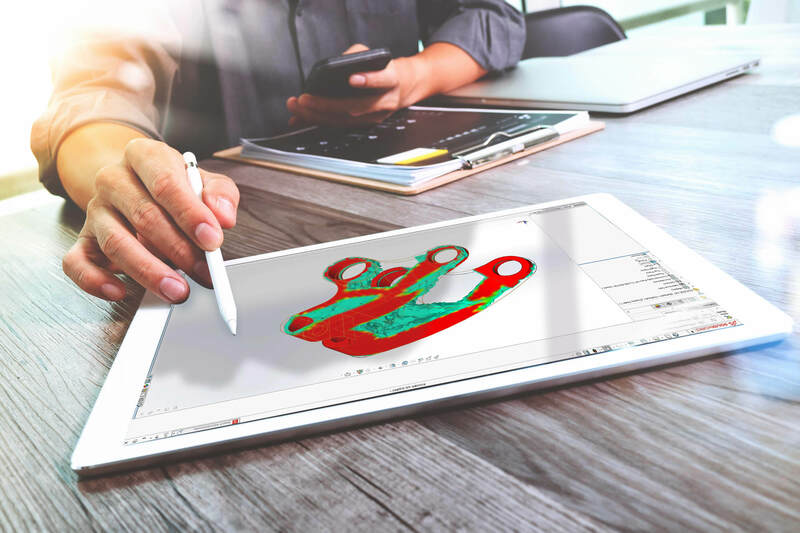 Analyzing machine designs, injection molded plastics, cooling systems, products that emit electromagnetic fields, and systems that are influenced by fluid dynamics are just some examples of how companies leverage design analysis. In the field of mechanical engineering, design analysis can solve a wide range of product development problems. Engineers can use design analysis to predict the physical behavior of just about any part or assembly under any loading conditions: from a simple beam under a bending load to car crash simulations and vibration analysis of aircraft. The true power of design analysis is the ability to perform any of these types of studies accurately without building a single thing. All that is needed is a CAD model. Analyze fluid flow, whether it be a gas or liquid in a pipeline, the mixture of air and fuel in an engine intake manifold, or molten plastic filling up a mold. Besides working very closely with CAD packages, commercial design analysis applications also interface with increasingly popular programs for motion analysis to create complete virtual analysis and test systems. In other engineering disciplines, design analysis is used to study electromagnetic fields, soil mechanics, groundwater flow, bone growth, etc. Rod has been using 3D CAD software for over 25 years and has trained thousands of designers to use their CAD systems more effectively. Rod is the Javelin Webmaster and is based in Ottawa, ON., Canada. Home › SOLIDWORKS Simulation › What is Design Analysis?